“Luke always keeps my needs first and foremost, and I never feel like he's rushed. He takes as much time as needed. He's also friendly and fun.” –N.W. “Luke has been the answer man for us.” – S.S.
“I retired June 30, 2016 and Jim and I each needed a supplemental medical policy and a prescription plan. Luke walked us through this process. His recommendations were ‘perfect’ for us....he set the supplemental policy and gave us step by step instructions on getting set up with the prescription plan. We ran into some ‘glitches’ with the prescription plan and he returned our calls immediately. He never made us feel he was ‘too busy.’ We could not have been more pleased with the ease of this transition and Luke's professionalism.” – S.W. Luke helps his clients enroll in Medicare and answers any questions that may come up about the process. He does a policy review with his valued clients every year to make sure they're in the best spot possible. He’s always available when questions or concerns arise. Luke also helps with service issues, so if you have a claim or need forms, he takes care of that for you. 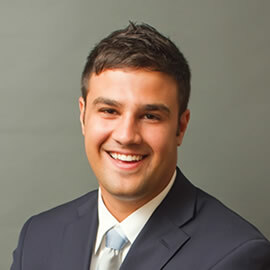 Luke has his Life and Health Insurance License (#15818451), is up-to-date on continuing education and ethics training, and graduated from Millikin University in 2011. Luke is married to wife Tessa, and has two beautiful children – Hazel and Houston.